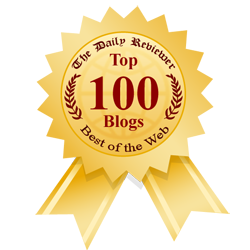 Sister Aishah's Islamic Journey: Muslimah Writers Alliance (MWA) Celebrates Ramadan! 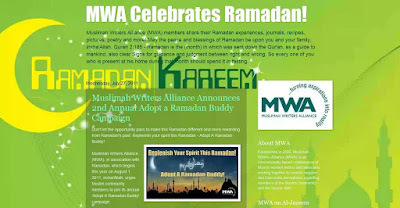 Muslimah Writers Alliance (MWA) Celebrates Ramadan! 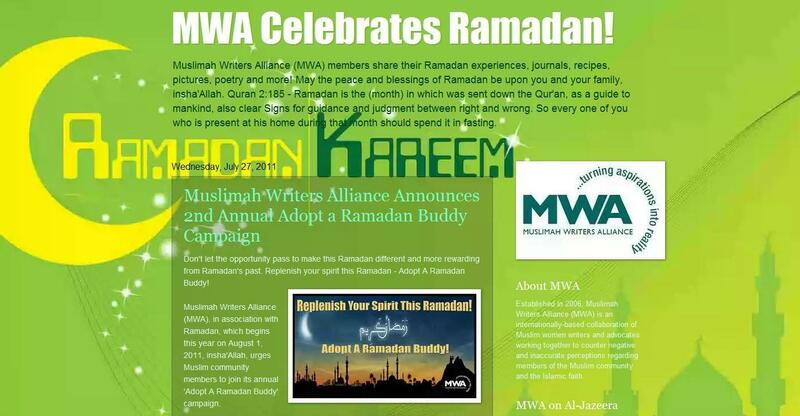 Muslimah Writers Alliance (MWA) members share their Ramadan experiences, journals, recipes, pictures, poetry and more! May the peace and blessings of Ramadan be upon you and your family, insha'Allah. Join the MWA Ramadan celebration! Let all Muslims celebrates Ramadan. May the peace and blessings of Ramadan be upon you and your family, insha'Allah. Salaat(Prayer) O Ramadan(Fast) Organizer – Automatically detect your location and accurate timings of Salah, Sehr n Iftar. * Sehar and Iftar Timings (Ramadan Special) – (According to your area automatically). * Countdown Timer to either Sehar or Iftar. * You can see Prayer timings for not only month of Ramadan but also for the whole year. * Plus if you travel to another location you don’t need to change the application it’ll detect the timings automatically for you. * Count down timer to (Sehar/Iftar) presents you with ability to estimate time to travel to your friend’s place or any other location in time. So you don’t miss Iftar/Sehar. * Dua of Sehar and/or Iftar will automatically be recited when its time to Sehar/Iftar. * Countdown timers for next prayer. * Prayer Logging i.e. Log which Prayers you’ve offered and see tabular/graphical stats.